With a wide array of business enterprises investing heavily in the mobile promotional channel, it doesn’t come as a surprise that more and more consumers have started using their smartphones and tablets for accessing products and services. Knowing the fact that around 91% of people keep their smartphones within 3 feet of themselves, 24 hours a day, 365 days per year; have a well-aligned mobile solution for your business definitely serves as a huge plus point. It’s not just about creating a ‘wow’ factor for your business product/service range, but even your company’s employees can greatly benefit from having a good mobile solution in hand. Witnessed as an innovative frontier for brand differentiation and business growth, it is the mobile channel which is being used globally by both startups as well as established business organizations. Connecting business units with IT(Information Technology) has played a vital role in ensuring complete control, security and management of business processes and customer relationships. 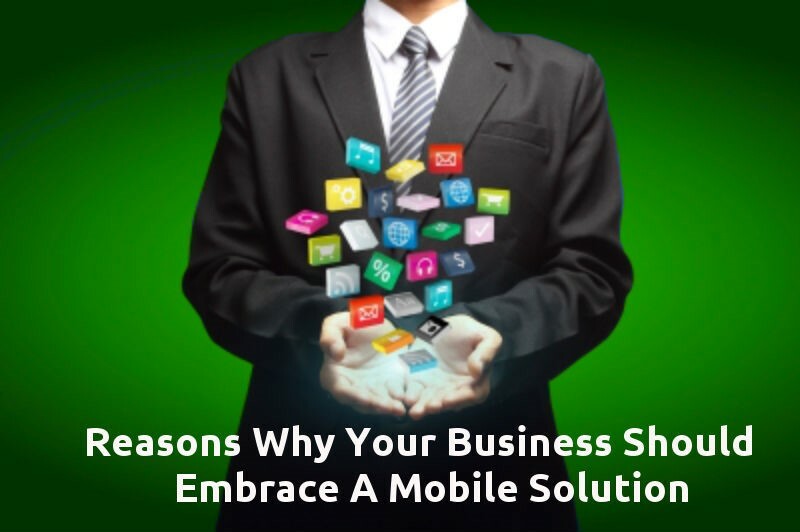 Continue reading this post to find some solid reasons backing the need of a perfectly designed mobile solution for your business. One of the best things about a mobile application is that it serves as an excellent communication platform between you and the targeted customer. It is a crisp mobile app which informs the customers about all the latest deals offered by you. Plus, you can use the app for sending coupons etc. to your customers. It’s a common perception that a business which is technology savvy is the one that can be trusted. By making your brand available on all major app stores, you can effectively open up new avenues for people who are on a hunt for products/services similar to the ones offered by you. Capturing a unique mobile space is a sure-shot technique of reaching out to your target audience. A great mobile business app can turn to your handy tool when it comes to rendering customer support and service. This mobile app will allow your customers to view products and create a buying decision while on a move. Additionally, the valuable time of your customers also gets saved with a mobile business application. As a business owner, you can considerably improve the sales and revenues using the location-based push notifications. For instance, if you own a coffee shop, then someone who’s looking out for a coffee shop within one mile radius of your shop can receive notifications about the discounts, coupons and new products that have been launched by you. In the current world of smartphones, where you can find multiple solution providers for the same issue, it takes a lot to create a unique niche. Mobile channel is the best thing here, reason being that a well-designed mobile application will keep customers engaged with your product/service range. By making it convenient for the customers to get in touch with your firm, you’ll be successful in generating a loyal customer base. If you own a business enterprise, then investing in mobile app development will allow your employees to get connected with the data that they need in order to produce the desired final product. One of the major considerations for every entrepreneur is the way customers would be adapting their decision to make purchases via their smartphones and/or smart tablets. With the convenience of a mobile app, you can encourage customers to make purchases via a finger swipe. As a business professional, a mobile solution can enable you to track all your business assets in addition to expends over a specific duration of time. Developing a cross-platform mobile app will help you gain an instant access into the monthly performance of your employees. More and more business organizations are turning to custom mobile solutions that can allow them to personal data from the corporate one. As per a recent survey, it has been found that over 20% of BYOD(Bring-Your-Own-Device) programs tend to fail simply because IT has been trying to implement too restrictive MDM solutions. While a web presence for your business is prone to bad reviews and incomplete directory listings; it is a mobile presence that can scale up your business in the Google search engine results pages. As an entrepreneur, it is your responsibility ensure complete security of customers who choose to invest their hard earned money into your products and services. By making a cross-platform business mobile app available for customers, you can assure no visibility or control over the customers’ personal stuff. With excellently designed mobile app, you can find new business opportunities simply because of the way that they are being used. That means, it’d be possible for you to identify refined ways of resolving common customer problems. This would directly lead to upliftment of the quality of your products and services. No one can ignore the significance of connecting a smartphone with a social network. Mobile apps have serves as ideal platforms for making the most of your social circles. So, with a mobile app dedicated to your business, it’d become feasible for you to drive higher traffic via optimum social media engagement. The volume of customer data gathered via your mobile app is definitely a thing to treasure. With this information, you’ll be able to identify the unique customer needs, the most promising and profitable regions along with the demographic segments that require your attention. Therefore, you’ll find help in developing improved products that can meet the needs of a wider group of customers. In addition to smartphones and tablets, the growing use and popularity of smart watches and Google Glass has indicated the ever-evolving nature of the mobile world. Hence, investing in mobile app development today would place you in a comparatively stronger position to take full advantage of the future mobile technologies. With tons and tons of advantages associated with having a target-oriented mobile solution, there is actually no point of staying away from development of a mobile-friendly website and app for your set of customers. Lucie Kruger is an application developer working with Mobiers Ltd, which is the leading Android application development company. She provides concrete information on latest information on mobile technologies like iOS or Android development processes.